Today we travel northeast of Orlando to the legendary Daytona Beach, famous for Spring Break, the Daytona 500, and Bike Week. You would expect such a tourist magnet to be clogged with chain restaurants…and it is. There are a few sparks in the sunny landscape that is otherwise clouded with dreary sameness. After all, you travel to Daytona to get away from the rat race and the last thing you want to do is drink the same McBucks coffee you get at home. That spark is Sweet Marley’s Coffee on Beach Street. As you walk up to Sweet Marley’s, you immediately know it is not going to be a Buckdonalds clone and it is not going to be a greasy spoon. There are a few tables outside for those wishing to soak in the beautiful Florida weather. 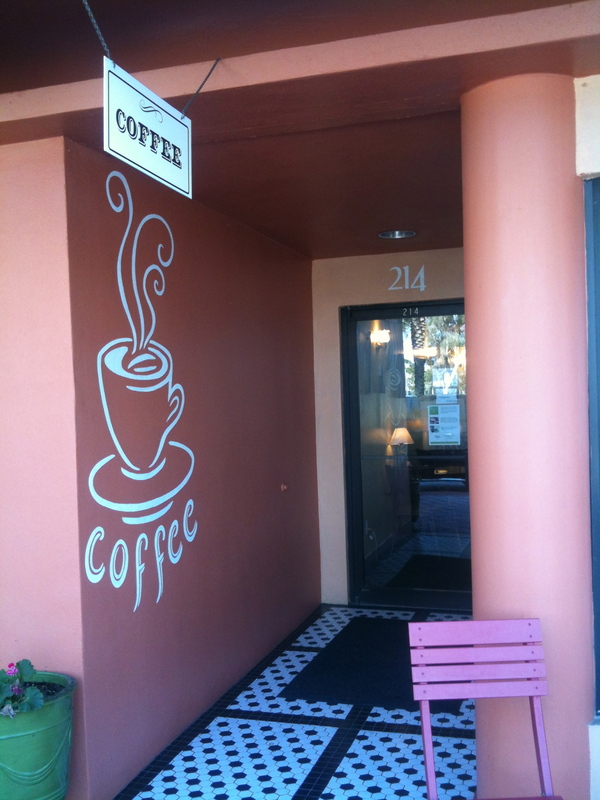 There is also a nondescript coffee sign above the door and a coffee mural on the wall of the entry. Upon entering, you are not greeted with Seattle’s idea of efficient design, but with warm, welcoming, comfortable decor. There are plenty of tables of various sizes and a couch at the front window. The service area is a standard arrangement, with a pyramid of products and easily readable signage. 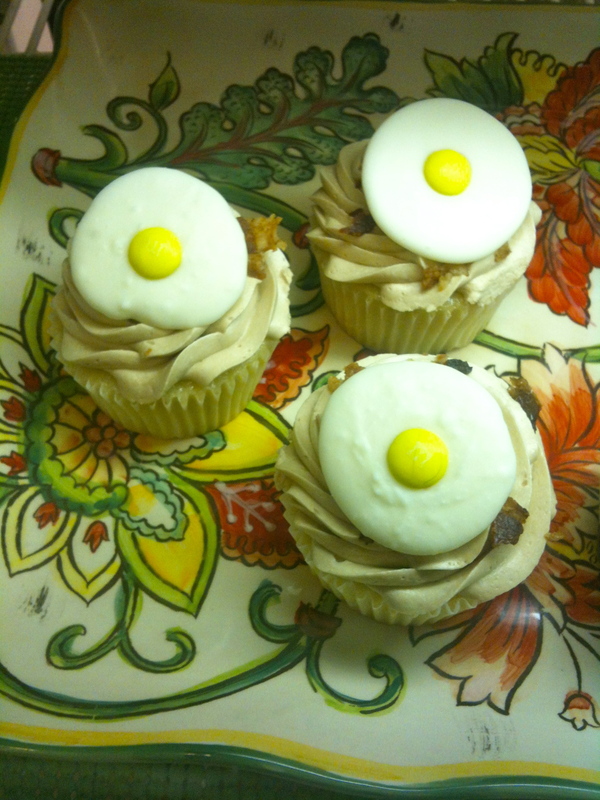 The first thing that is special about Sweet Marlay’s is the owner, Tammy Kozinski. When she opened her coffee shop, she wanted it to be different and good. Her baked goods are excellent. The pastries are all fresh and Tammy is not afraid to try something different. On my visits there, I tried a Maple Bacon Cupcake, made with a sugar sunny side up egg on top of bacon strips, and a guava cheese turnover. Both were incredibly delicious. Tammy tells me that when she tries a new recipe, she polls her customers. If the new item is not well received, it is not made again. Survival of the tastiest. Choffy tastes like a very weak dark hot chocolate made with water. There is no hint of creaminess, but a bit of malty sweetness that is also prevalent in the aroma. The bitterness from dark chocolate is there, but not overwhelming. I finished the pot about 5pm and was pleasantly awake for many hours with no hint of caffeine edginess. More about Tammy. She clearly works to offer her customers something special and to make her business successful…and that is the thing that sets Sweet Marlay’s apart. Tammy cares. She does not know what “good enough” means. If it is not different and great, it is not in her coffee shop. 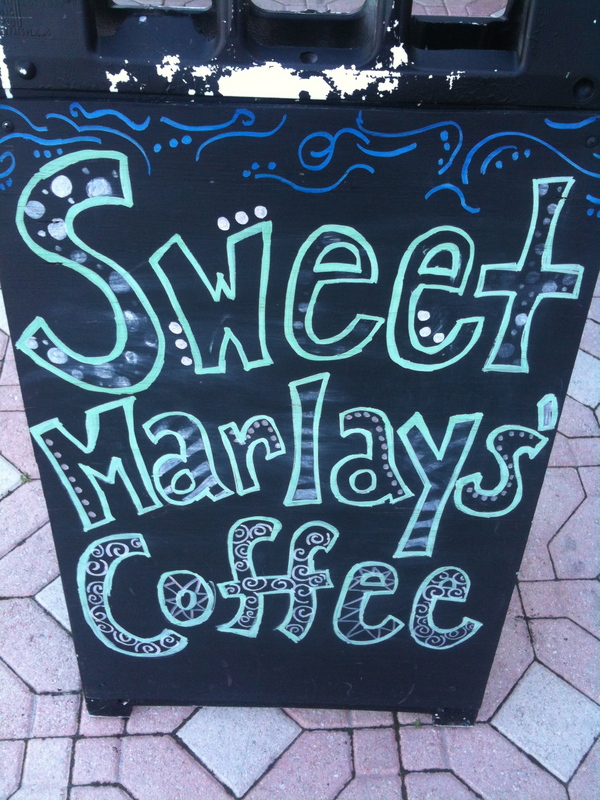 If you are in or remotely near Daytona and want to relax with a great pastry or want to try a pot of choffy, make your way to Sweet Marlay’s. When I created this blog, I was going to limit posts to just amazing places in Florida. I found in my travels, however, that I have a problem. There are places that don’t live up to their hype. Places that seem promising or advertise a new twist on an old idea, but fail to deliver. Since I do not want to waste the effort I put into exploration, I have created a new category for this blog, “mediocre” places. When you see (Mediocre) in the title of a post, you know that the place is thoroughly “meh” and can safely be passed over or mocked. 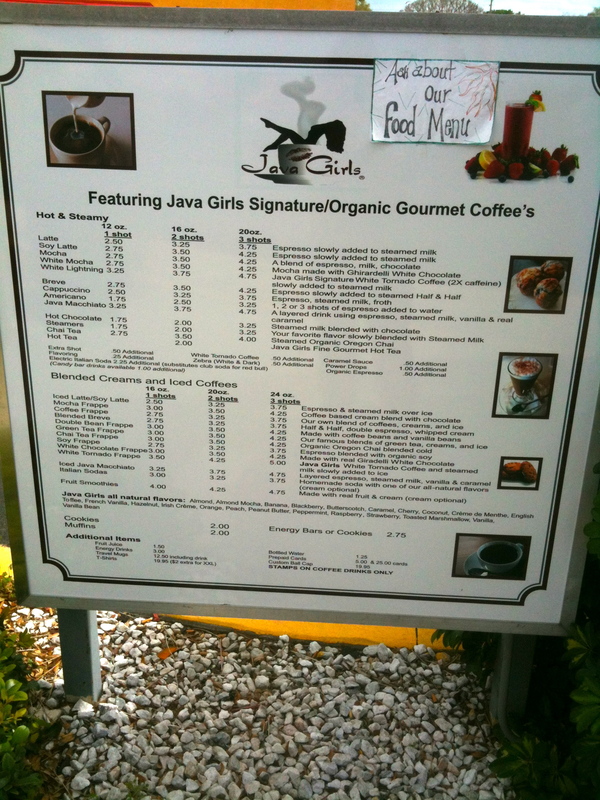 Such a place is Java Girls in Orlando. Promising to be the coffee shop version of bikini carwash or Hooters, it doesn’t live up to its own hype. Their website prominently displays pictures of lingerie and bikini clad young women and promises visitors the “ultimate specialty coffee experience”. This could not be further from the truth. Looking at the website, you envision a smaller version of Hooters where you can sit and be waited on by beautiful young women. What you find instead is a run down stand with drive thru and walk up only service. The building is easy to miss as it is an out parcel of a large shopping plaza on Lee Road in Orlando and the parking lot is difficult to navigate. Go to the drive thru and expect some frustrations as you maneuver around the tiny building. As specialty coffee preparation is inherently slow, also be prepared for a wait and potentially long lines. Their website is advertising a second location opening soon near UCF. Hopefully that location will be easier to find. If you choose to walk up, you have to walk across the drive thru lane to get from the parking area to the walk up service window. There are a couple of outdoor tables at which to sit and a nice sign (grammatical errors aside) displaying their menu. There is the standard selection of hot (Hot & Steamy in Java Girl Speak), iced, and blended coffee drinks, cookies, muffins, and sandwiches. When you look inside the establishment, you do not find ZZ Top video that is portrayed on the website. The young women that work there are indeed beautiful, but they cannot always be wearing lingerie or bikinis. Also, the interior is fairly messy. I ordered a coffee and a muffin. The muffin was not fresh and was stored in the refrigerator. It had to be microwaved before it could be given to me. In any case, there is no space on the counter for a rack for baked goods. Both the coffee and reheated muffin turned out to not be very good. Both the half finished coffee and half finished muffin went into the trash at my next stop. If you are in the Lee Road area and are looking for a good cup of coffee, I suggest going to the College Park or Orlando Ave areas and steering clear of Java Girls…unless, of course, you are not looking for good coffee, but going for coffee to get a good look. I am always on the lookout for interesting places, but I admit to driving by this restaurant many times without even noticing it. 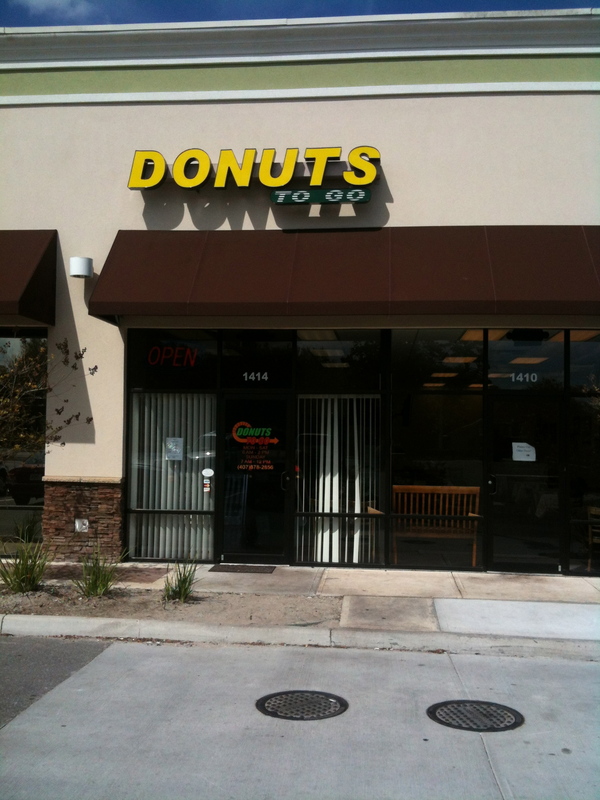 Donuts to Go 2 is set back, far from the road in a strip mall next to the hospital. Did I mention they're big? You would expect the shopping center to be full of stores pharmaceuticals and diagnostic services…and it is. 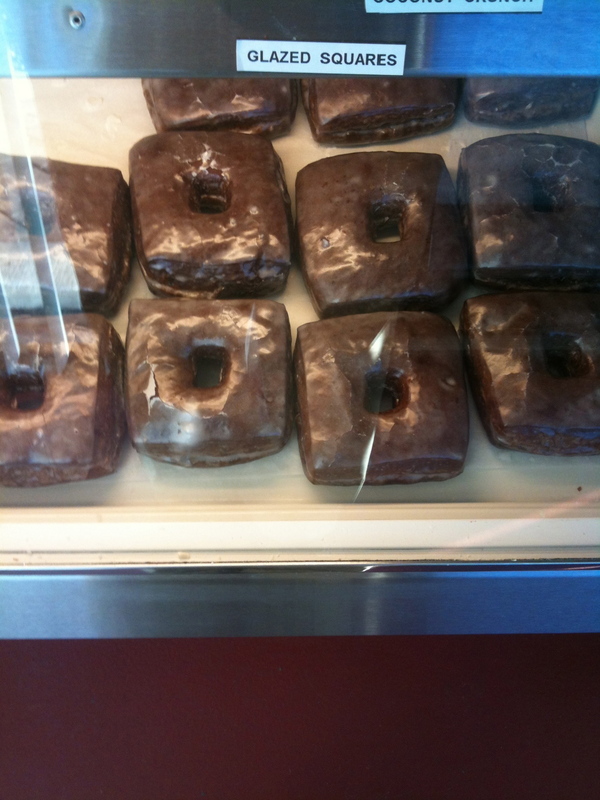 There is, however, an nondescript tenant next to a small drug store that sells square donuts. That’s right, square. 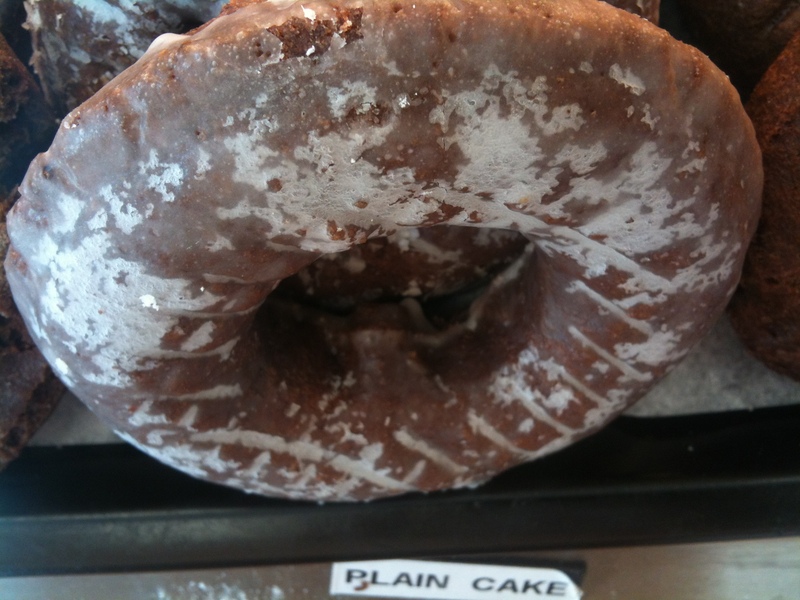 A square donut with a square hole. So what, you say. It’s a gimmick, nothing more. The donuts must be greasy. That couldn’t be further from the truth. When you bite into one of their huge donuts, it is soft and delicious. Not tough and dry. Not crunch and greasy. Not slimy and doughy. 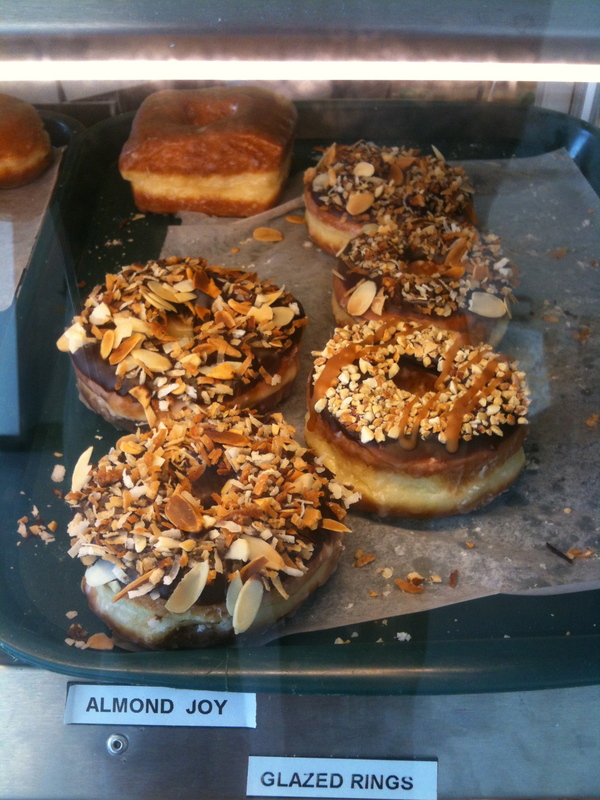 These are some of the best donuts I have ever had. Not only are the donuts great, but the service is top notch. While I was waiting in line, the person at the front of the line wanted for an apple fritter, but there were none. The person behind the counter shouted to the back and had the kitchen make a fresh one. In a few minutes it came out and was the size of a small dinner plate. 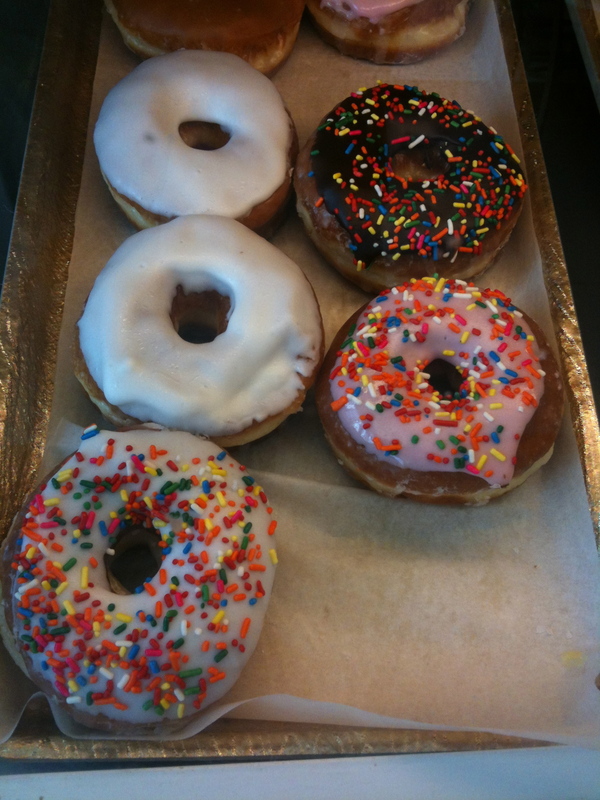 I, of course, took some donuts home. I had one the next day and it was still soft…no sign of staleness at all! There is also a regular food menu with plenty of breakfast and lunch sandwiches. 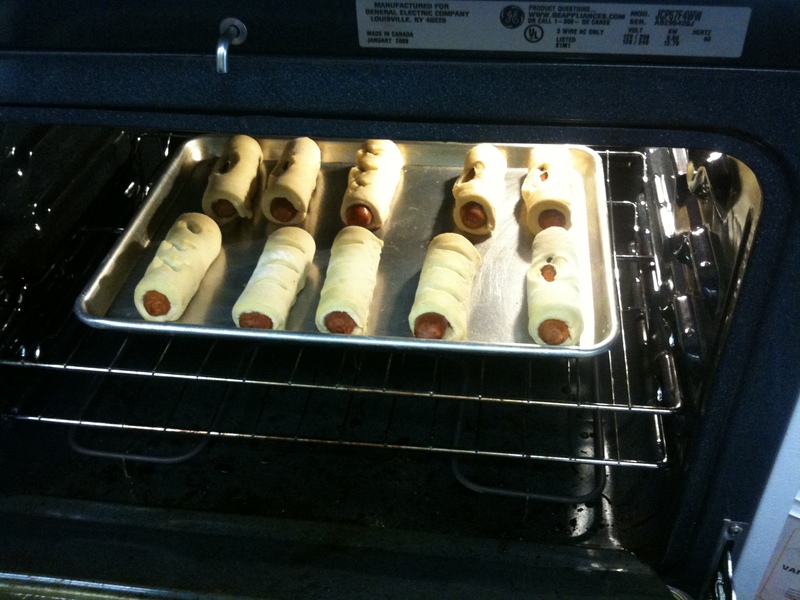 In addition, they make their own sausage rolls. These are people that care about making their restaurant something special. So if you are ever in Sanford, FL and looking for a really good donut, definitely head on over to Donuts to Go 2, you won’t be disappointed. No review of relatively unknown, but amazing places near Orlando would be complete without Beefy King. What is a Beefy King, you ask? Beefy King opened in 1968 as a chain restaurant. The chain failed, but the location in Orlando survived and has been a landmark ever since. 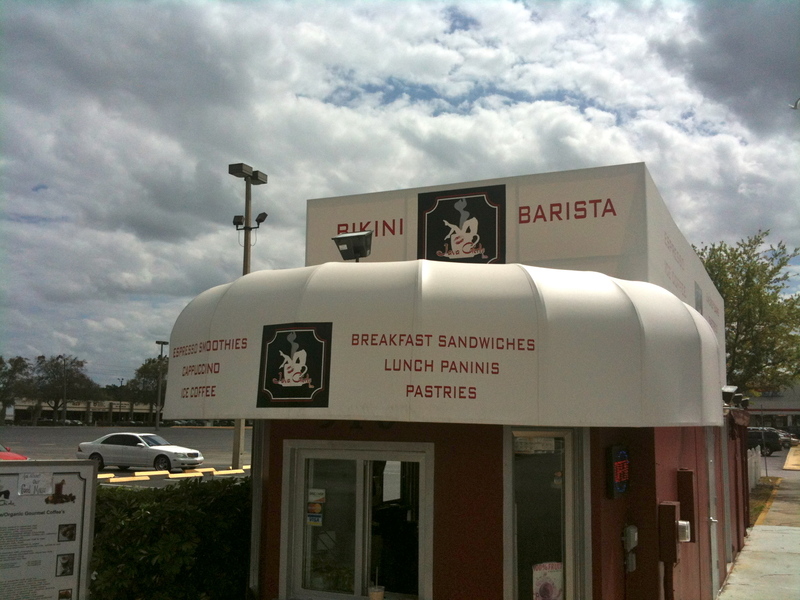 If you are driving on Bumby Ave, north of downtown Orlando, you cannot miss the iconic sign. The faire is simple: sandwiches, salads, sides, and drinks. Where they excel is in their roast beef. The name of the establishment is Beefy King, after all. The majority of customers order a roast beef, tatter tots, and a coke. The sandwiches come in sizes, regular, large, and extra large. All sandwiches are prepared to order. There are also a variety of BBQ sauces and other condiments available. 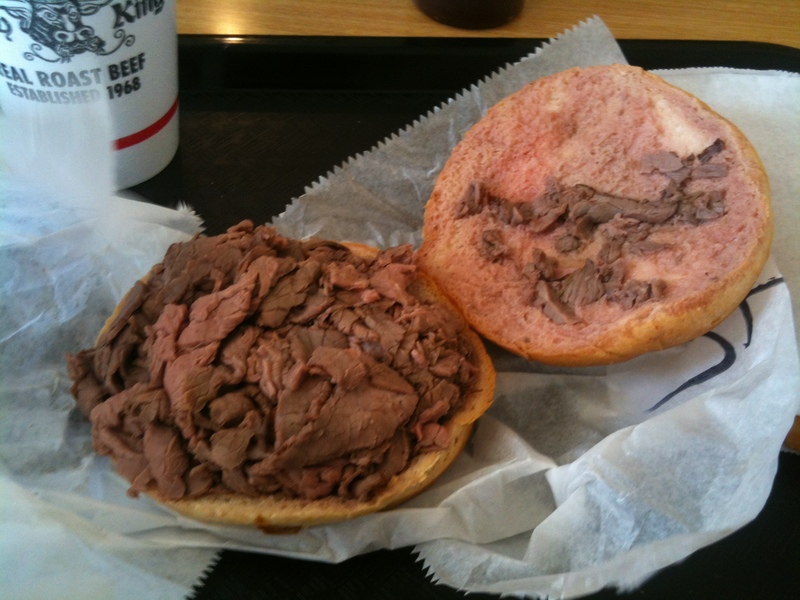 Is the roast beef rare? Yes it is. When you enter the parking lot, you may believe you have gone back in time. That’s most likely because the decor has not changed since the 1960s and you wouldn’t want it to. There is something special about sitting at a table, worn with age, enjoying a juicy roast beef sandwich, a bag of “Beefy Spuds”, and a fountain coke, knowing at least 3 generations have done so before you. You get the sense that you are a part of something lasting, something sturdy, something special. It is rare that something that started as an also-ran to McDonald’s would become something so authentic. Then again, it is rare that a chain store becomes the bedrock of a neighborhood while everything around it changes. The next time you’re in Orlando, take the time to go to Beefy King and step into a quintessential example of 20th century Americana. Sanford, Florida does not jump to mind when thinking of exciting places in Florida. Most of that reputation is well deserved as Sanford is, by enlarge, a quiet, residential town. It is, however, an older city than Orlando and has had a chance to develop a real, if small, Main Street. I shall probably write about a few places in Sanford, because there are a couple “diamonds in the rough” hidden among the antiques shops. 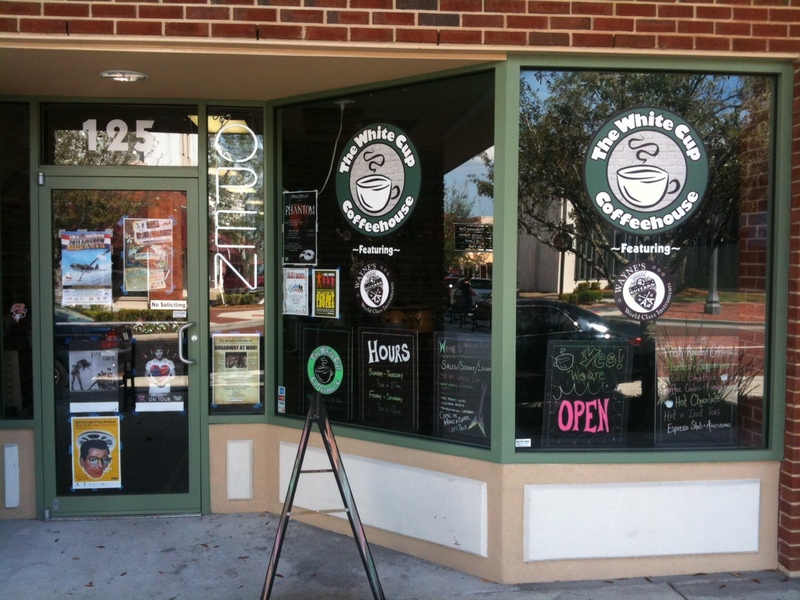 The subject of my first post is The White Cup Coffeehouse. The White Cup opened less than a year ago with the idea to be different from the stereotypical coffeehouse. There are the normal variety of espresso based drinks and food items for customers, a stage for performers, art for sale on the walls. Then you notice the differences. The house amps on stage are larger than you would expect. 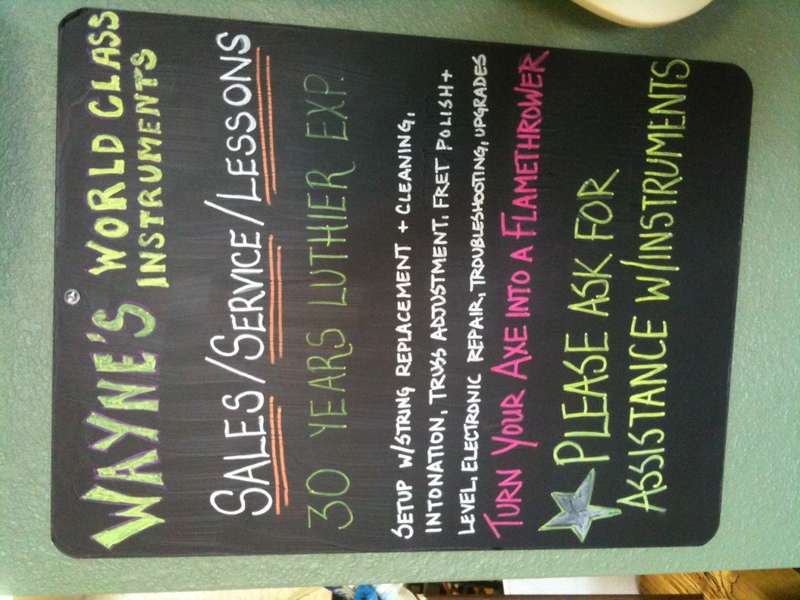 There is a guitar shop, Wayne’s World Class Instruments, in the middle of the coffeehouse. The sell a coffee called 3Caf, which has 3 times the caffeine of normal coffee. This is no cliched coffee shop. Monday night is called “Metal Mondays” and the coffeehouse hosts a strictly heavy metal open mike / jam. Local metal aficionados gather to exchange power cords and blistering solos. Wayne himself occasionally jumps on stage to join in. Soon, performers deemed not worthy will blasted off stage with a peal of thunder from “The Gong of Death”. Friday night is “Open Mike Night”. Performers are given 15 minutes in which to perform. The room is packed with people waiting to conquer their fear of performing in public. There are dozens of Coffeehouses in the Orlando area, but if you want a Coffeehouse that stands out from the generic coffee shops, definitely take the time to visit The White Cup. This place just keeps getting better. They have recently added Cuban coffees to their menu and they are top notch. Their Café con leche tastes salty-sweet like a melted toffee. The regular Cuban espresso is incredible as well. If you need a step up in caffeine from 3Caf, I highly recommend the Cuban coffees. smoked, garlic, extra garlic, light garlic, spicy hunter’s, and more. 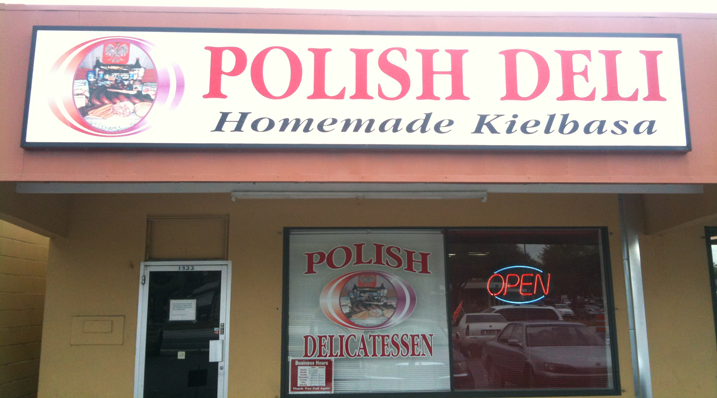 Not only do they make polish sausage, but other kinds of sausage as well. 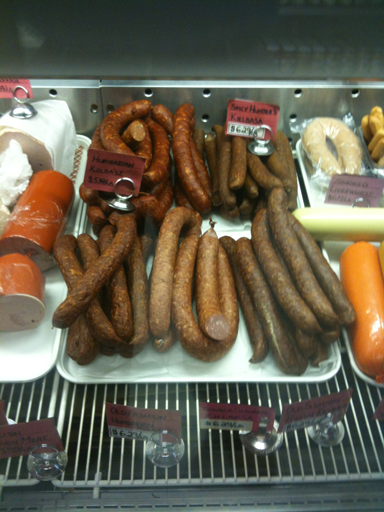 In addition, they have other kinds of preserved meats and Eastern European products. When you walk in the store, the woman behind the counter greets you in accented English and the smell of garlic makes you instantly hungry. This place is the real deal. Even though the whole cold case full of various sausages beckons you, their best product is the kielbasa. This is not some mass produced brand that looks and tastes like bologna. In the cross section of a hefty link, you will find large chunks of pork that would have been an entire mouthful on their own. You specify the amount you want, not by weight, but by the number of coils you wish to purchase. Only then is the mass of meat measured and priced. Be aware, that your trip home will be a tortuous one. The smell of the kielbasa will haunt you the entire way. It doesn’t matter if you put it in a bag or in your trunk. The smell will permeate through your vehicle and be a siren song, tempting you to dash your diet against the rocks of preserved pork.